1 What Is Disc Denervation? 2 How Is Disc Denervation Performed? Recent prevalence estimates have suggested that back pain remains one of the most commonly occurring health complaints both within the United States and also around the world. In fact, approximately 80% of the population is expected to suffer from symptoms of back pain at some point in their lives. 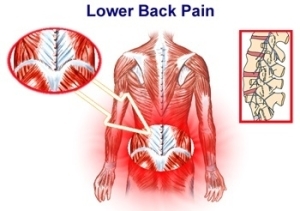 Moreover, lower back pain has been associated with significant impairments in terms of daily functioning and is among the most commonly reported reasons for employment-related disability. In many cases of back and neck pain, the symptoms can be traced back to the facet joints within the spine. Facet joints are shown to play a role in limiting the extension and rotation of the spine, aiding in the bearing of weight on the spine, and preventing the vertebral bones from slipping out of place. Facet joint disease is considered one of the leading causes of chronic neck and back pain within the United States. Treatment options for pain within the lower back typically depend on the source of the symptoms. One treatment technique available for managing lower back and neck pain associated with the facet joint is disc denervation. Disc denervation utilizes a technique known as radiofrequency ablation, which destroys, or ablates, abnormal tissue by applying extreme levels of heat through electrical stimulation. In cases of lower back pain associated with the facet joint, disc denervation will target those nerves located within the affected facet joint. Once the nerve tissue is effectively ablated, it can no longer transmit signals of pain from the lumbar region up to the spinal cord and brain. Additionally, disc denervation has been shown to also inhibit the release of neuropeptides, which are tiny, protein-like molecules that are used by neurons in the transmission of information. Thus, the pain-relieving properties of disc denervation are likely attributable to both the destruction of neuronal tissue and the inhibition of the release of neuropeptides. 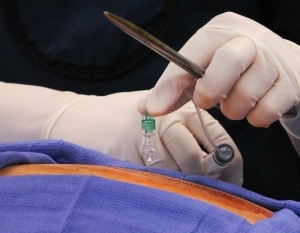 Studies examining the effectiveness of disc denervation for facet joint pain have revealed that it is an equally effective, yet non-surgical, alternative to back surgery. Further, some outcome studies have indicated that nearly 90% of disc denervation patients have remained satisfied with their results at a one-year follow-up. Patients who undergo successful disc denervation for the treatment of their facet joint pain are expected to report significant improvements in terms of their degree of pain and discomfort, mobility, and quality of life. Facet joints are found within the spine. The spine itself is comprised of small, individual bones, known as vertebrae that are stacked on top of one another. This forms the tall, flexible, and protective channel of the spinal column, the function of which is to protect the neural tissue of the spinal cord. Each vertebra is connected by two facet, or zygapophysial, joints on either side of the bone. In instances of injury or trauma sustained to the facet joints located within the lumbar region, pain information is transmitted to the spinal cord and brain by nearby dorsal rami. As such, the medial branches of the dorsal rami located near the affected lumbar facet joint are the target of the disc denervation procedure. Diagnosing facet joint-related causes can be challenging for physicians, as most pathologies are not visible through available imaging techniques. In some instances, the physician will confirm the diagnosis by injecting a chemical that temporarily inhibits the function of a specific nerve. Should the patient report improvement in their symptoms of pain from this procedure, then the diagnosis is considered to be confirmed. Disc denervation does not require surgery and can be done on an outpatient basis. The entire procedure can take less than one hour to complete. During the procedure, the patient is positioned so that they are lying facedown. In some cases, only a topical local anesthetic is required. However, some patients may wish to be completely sedated during the procedure. In these instances, patients are generally given medication using an IV and their vital signs, including respiration rate, heart rate, and blood pressure, are monitored closely throughout the procedure. The physician will make a small incision in the back, which will be used to insert the fluoroscopy device. This device is equipped with a light and tiny camera that the physician will use to guide the electrode into the proper placement. In cases of facet joint pain, the medial branches of the dorsal rami located in the area of the affected facet joint are the primary target of the procedure. Once the physician has confirmed that the electrode has been placed in the appropriate position, it is then connected to a generator that is also grounded to the patient’s skin. When the generator is activated, electrical stimulation is delivered to the tissue of the affected nerve. Heat generated from this electrical stimulation acts to ablate or destroy the neuronal tissue. Once the procedure is complete, the electrode is removed. 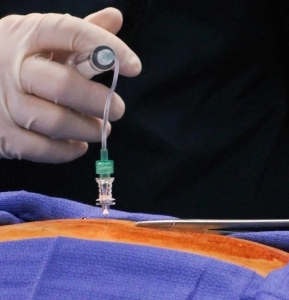 In order to seal off the pathway created by its insertion, the electrode may be kept active, which will cauterize the surrounding tissue during the removal process. In general, patients who suffer from chronic and refractory facet joint pain are regarded as the ideal candidates for disc denervation. More specifically, patients suffering from intervertebral disc pain have reported achieving symptom relief from disc denervation. Intervertebral disc pain can arise as the result of degenerative disc disease, herniated/bulging disc, or spinal stenosis. 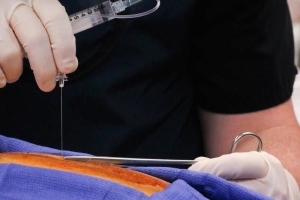 Disc denervation is a procedure that utilizes radiofrequency ablation to treat cases of chronic or refractory pain arising from the area surrounding the facet joint. This treatment technique has received support as being equally effective as surgery for chronic back pain. The procedure takes approximately one hour and can be done on an outpatient basis. Many patients will report significant reductions in pain, as well as improvements in their overall mobility and quality of life. Finch P. Radiofrequency denervation of the annulus fibrosus: A rationale. Techniques in Regional Anesthesia and pain Management. 2004;8(1):41-45. Henschke N, Kuijpers T, Rubinstein S, Van-Middelkoop M, Ostelo R. Injection therapy and denervation procedures for chronic low-back pain: a systematic review. Eur Spine J. 2010;19:1425-1449. Levin JH. Prospective, double-blind, randomized placebo-controlled trials in interventional spine: what the highest quality literature tells us. Spine J. 2009;9(8):690-703. Manchikanti L, Pampati S, Cash KA. Making sense of the accuracy of diagnostic lumbar facet joint nerve blocks: an assessment of the implications of 50% relief, 80% relief, single block, or controlled diagnostic blocks. Pain Physician. 2010;13(2):133-143.